The Smiths' debut single, "Hand In Glove" was released on this day in 1983! The single was the public's first taste of the band that would go on to be one of the most influential bands of all time. One night in January 1983 Johnny Marr wrote the riff and knew immediately he had something great, and he couldn't wait to get the music to Morrissey. He revealed to the Daily Mail that he didn't have anything to record the riff on, so he had to play it over and over in the car on the way to get his creation to Moz. Morrissey wrote the lyrics that night and the song came together the next day. Three days later, the Smiths found out that Rough Trade was interested in releasing "Hand In Glove" as a single. And the rest is history. Read the full interview with Marr about the making of "Hand In Glove" here. 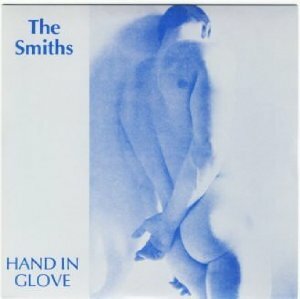 The version of "Hand In Glove" found on the 7" single is slightly different from the version that would eventually be released on the band's full length debut album the Smiths in 1984. [The 7" version found renewed light of day on the Smiths' compilation album Hatful of Hollow.] A live version of "Handsome Devil" was the b-side to the "Hand In Glove" single.